Click the image for a full size wide field display. Celestron C11 @ ~f/10.48 (2930 mm fl) 1.27 arcsec / pixel, resampled to 1.91 arcsec / pixel. Spiral galaxy M94 has a ring of newly formed stars surrounding its nucleus, giving it not only an unusual appearance but also a strong interior glow. A leading hypothesis holds that an elongated knot of stars known as a bar rotates in M94 and has generated a burst of star formation in the form of an outward moving ring. 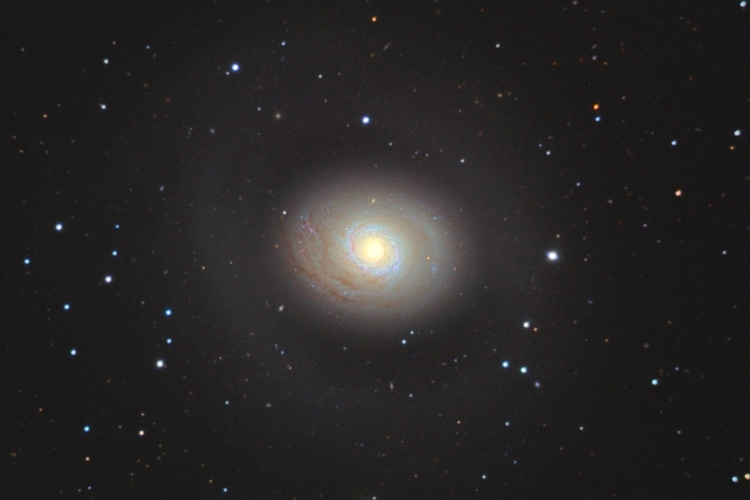 M94 spans about 30,000 light years, lies about 15 million light years away, and can be seen with a small telescope toward the constellation of Canes Venatici.